My father cast my mother as the villain. My father said to my brother and me: “Doesn’t she remind you of Evil Bavmorda?” My father pointed at my mother and shouted. She did not smile or laugh. “Evil Bavmorda!” My brother and I parroted my father. ITS OWN ARRANGEMENT BY ROBERT EARLE, DISSOCIATE BY MADELINE JAINA, AFTER STEPHEN BY LISA LOPEZ SNYDER, JAMES BY THORSTEN BERNAU, THE IMPASSE BY JAMES BUCHANAN, THE BEAUTIFUL FAMILY BY KIRKLEY MEHNDIRATTA, GREED BY MICHAEL WASHBURN. My goal is to be the person I needed when I was younger. Words give me perspective as I try to navigate my connection with my body and who I am in this big, big world. I am a playwright and singer, songwriter from Canton, Ohio. I moved to New York when I was 18 for school. I went to The New School for Drama and studied Oral History and Dramatic Arts. I am now interning at The Truth Podcast. I have a work in progress album of songs called People Under Blankets on SoundCloud , songs recorded in my bedroom, and poetry. I also produced a collection of interviews centered around love and moments of change called God Was On The Radio Last Night, also on SoundCloud. Some day I will make money off of people listening to these things but for now I share with friends. I am still young in my writing career, but I am focusing on standing behind my words. It can be scary to be vulnerable but at this point, I don’t know what else to do. The idea for After Stephen came to me after a professor I had in graduate school was stuck in an elevator on his way to class. While we waited for him after getting his text, I started to think about how frequently we’re vulnerable to the daily risks of technology’s failures. In an elevator you’re transported instantly with just the click of a button, but this box contains you—and can trap you—nonetheless. I work as a freelance writer and consultant, but the creative world is my refuge. My work has been published in The Raleigh Review , The Foliate Oak Literary Magazine , The Scrambler, Gravel, and other publications. My essay In Transit won The Chattahoochee Review ’s 2011 Lamar York Prize for Nonfiction. I have an MFA in fiction from the University of South Carolina and was the 2015 Carl Sandburg Writer-in-Residence. I see writing as an act of expression and liberation—catharsis—for the writer, and, just as importantly, for the reader. I write about my shame and I write about my pride—the mix of emotions growing up in a dysfunctional yet affluent family that saw its rise in the 1980s through the dot-com bubble, like much of suburban white America, and witnessed its subsequent, post 9/11 fall from grace. A family’s brutality and insidious abuse can lurk under a mask of so-called “perfection” or silence. The mask both obscures the truth and reveals it. I felt a strong desire to unearth the truth of the family in which I grew up, even if it revealed the less-than-admirable qualities under the surface. Other creative pieces of mine have been published in Turk’s Head Review and in Extract(s). I teach undergraduate writing in Boston. Most people are born, live, and die without ever learning of the existence of the tiny island of Nauru in the remote central Pacific Ocean. One of the wealthiest nations in the world for a brief time in the 1970s, thanks to its phosphate deposits, the island today is a desolate rock pitted with depleted mines and ringed with a fringe of road and beach. It has been the misfortune of Nauru’s people to live at the nexus of competing imperial ambitions and commercial interests for much of the island’s history. The relatively few articles in the mainstream press covering Nauru’s plight tend to focus on the history of phosphate mining on Nauru and the island’s more recent ill-advised roles as an offshore money laundering center and a place of detention for refugees nobody wants. Often left out of the reporting is any effort to explore the machinations going on far beyond the tiny island’s borders and look into how the world could have treated Nauru so callously. I have attempted, in a fictional medium, to do just that. I am a Brooklyn-based writer working as a financial journalist in Manhattan. My fiction has been published recently in the Weird Fiction Review , Green Hills Literary Lantern, Rosebud, Adelaide, The New Orphic Review, and Meat for Tea: The Valley Review. I did, one night, find myself standing on a roadside trying to convince my son’s mother to get back in the car so we could get to a hospital. I’ve never lost the emotion or sense of frustrated panic from that night. Nor could I ever forget her words, and the anger and frustration that were behind them. It may seem that this story is non-fiction rather than fiction. There is a hair’s breadth of a difference, but it is a consequential difference. In the story I try to create and convey an intensity that was lacking in the real-life event. In real life I knew I would get her back in the car. In the story, the young man isn’t so sure. There’s also something in this story that I think captures a bit of who I believe I am as a writer. When asked, I tell people that I am as much a blue-collar writer as one could be. I have always been an outsider looking in on the literary world. I don’t have an MFA, and I have a certain antipathy to the whole notion of MFAs, though accepting it is a credential that opens a certain set of doors that lead to a literary life. Connections, pedigree, and other validations also provide access into certain provinces of artistic and literary life that I, and many others, are not part of. But still I am a writer and I earn my living as a writer. It is often a scramble and there are many days when I wonder if it is all worth it. Then I write something I can’t get out of my head. I lie in bed thinking about it and what the words and story mean to me, and I realize that I can’t quit. I just can’t. Perhaps some day it’ll all come together, and I’ll know what financial security feels like. Happiness is more than things. Happiness is working to build on what I love doing, knowing I am leaving something behind for my kids when they reach an age where they want to know more about and understand their father. I try to write a story in a way that suggests it could only be this story; it couldn’t be rewritten otherwise; the sentences are interlocked, one to the next; the dialogue is psychologically true; and yet the whole project is my attempt to make the impossible, possible, aesthetically rendering what most of us are unlikely to see as now unlikely to miss. There it is: that compelling oddness, that gesture, that hesitation, that kindness, that twisted relationship, that hope, that limb of that tree. What would be the point of writing if writing were only the unremarked flow of living, impressions barely absorbed, thoughts left incomplete, conversations just snippets, random, lacking context? For me, and I think for most writers, writing is intense commitment; whatever happens in the story happens in the writer. I had no idea how hard I work when I write until I sat down to write something a few weeks after hip replacement surgery. I had made it to my study. I had sat down at my desk. I had an idea. And I simply couldn’t keep at it after five minutes. My body was totally involved in physical healing, and I didn’t have a teaspoon of energy I could use for the ostensibly non-physical act of “just writing”. So off I went, slowly, to bed, someone who every morning of the week writes for three or four hours and sometimes returns to write some more in the afternoon. I wrote this story after I was much more fully recovered. I fictionalized the setting around where I live (between Durham and Chapel Hill, North Carolina) and invented the characters and incidents. As usual, I wrote a draft that went on longer than necessary. Then I set about focusing on the unique elements, often attracted to incongruities (I love incongruities, of course), and played up the pastor offering grief counseling because he was completely not of Patricia’s emotional world, at that moment or at any moment. Her wry, witty husband, having died, could only play a posthumous cameo role, but I enjoyed his fundamentally ironic attitude toward what he was doing when he died. Then Patricia had to consider the children and the fact that children all are so different from one another and have such different relations to their parents and are so difficult to reconcile within the embrace of a family’s loss. I really don’t know how many times I revised this story. I don’t keep count. I don’t care. I don’t have deadlines. As a general rule, my stories become shorter and shorter as I revise. I tell myself that no one will ever know what I left out, and by the time I have the feeling that I’m through, I don’t either. Whatever it was, it didn’t fit into the idiosyncratic truth I was pursuing, so it had to go. I avoid falling in love with what I’ve written and focus on falling in love with what I’m trying to write. CV: My most recent collections of stories are She Receives the Night (Vine Leaves Press) and Nowhere is Always Somewhere (Wordrunner Press eChapbooks). 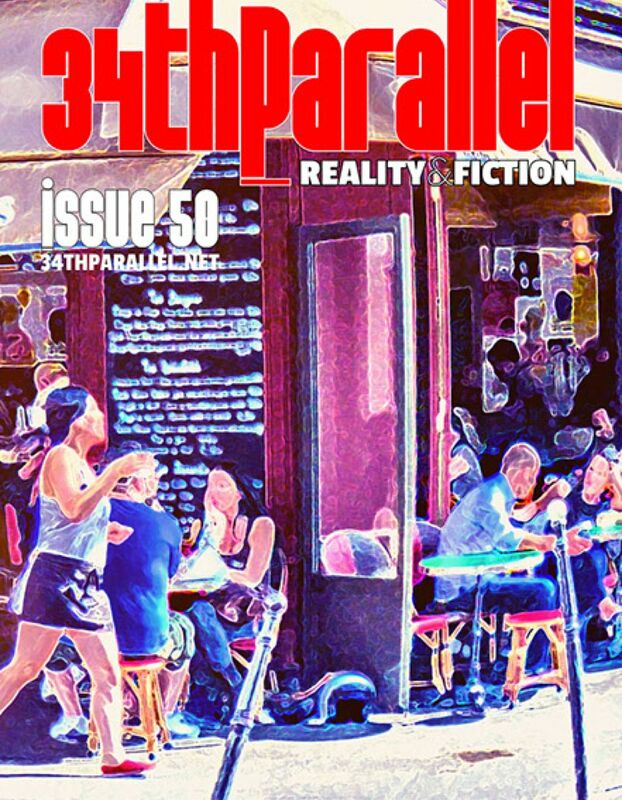 I have published more than 100 stories in magazines like 34thParallel, Mississippi Review , Quarterly West , The Common , The Literary Review , Wraparound South , Mud Season Review , The MacGuffin , etc. I also have published a book of nonfiction about a year in Iraq, Nights in the Pink Motel (Naval Institute Press), and a novel, The Way Home (DayBue). Through my writing I aspire to help people think and reflect on the world they find themselves in, and by doing so instigate conversations which bring people to an understanding of each other. I write what moves me, what I think I know, my version of the truth. I am searching for my voice. We are all, at any given time, a victim, an aggressor, an actor, an observer, all the while growing or dying, because of what we see, what we do, what we have done, to others, for others, or through others. I draw on my experiences as a husband, father, global citizen, from public service and private business, having grown up and worked in Europe, the Middle East, Central America, and the US.